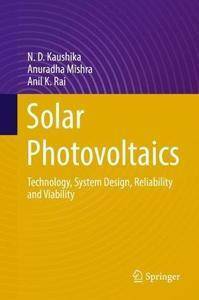 This book presents a quantitative description of the physics of solar-cell materials, transport processes, fabrication methods, and offers a scientific understanding of the technology involved. It also presents the current knowledge of the electrical characteristics of modules arrays and balance of systems (BOS) for a wide spectrum of applications. It particularly focuses on solar-powered communication systems and building integrated photovoltaic (BIPV) systems, exploring the reliability and viability aspects in detail. The book is of interest to application engineers, practitioners in private and government agencies, as well as graduate and postgraduate students.